Every so often a cover jives with me in such a way that makes me want to scour the entire internet to find out more about its design process. J.J. Johnson’s This Girl is Different is precisely one of those covers. Please join me in welcoming J.J. to the blog in today’s Authorthoughts! TCG: With this being your debut novel, how much anticipation did you have towards the design of your cover? Did you ever have any ideas about what you thought TGID’s cover should look like? Did you provide any concept input to the Peachtree team? JJ: I really didn’t have a sense of what the cover might look like, and I didn’t give any concept input to Peachtree. The only thing I knew for certain was that I did NOT want what I call a “headless girl body” cover: those YA covers with a photo of a skinny teenager, wearing trendy clothes, whose head is either cropped out of the picture or hidden behind some object. I assume those covers are trying to encourage readers to picture themselves as the heroine (“insert your face here”), but I think they’re very objectifying. Our culture already tells girls to think their bodies and clothes are the most significant part of their identity, and “headless girl body” covers reinforce that idea. What does it say when the heroine of a novel doesn’t have a head worth including on the cover? It’s a subtle message, but it’s unhealthy. Readers need to see whole people, with strong minds and smart brains attached to their healthy bodies. TCG: What was your very first reaction when you saw the final design? JJ: I couldn’t be happier with the cover. Peachtree was kind enough to involve me in the process (and I was very appreciative, because most of my author friends have had no input into their covers). Peachtree sent me mock-ups of three different covers, and my editor and I agreed— we loved the one that was ultimately picked. TCG: I’m going to be honest here, TGID’s cover was one of those covers that made me pause because of how, well, different it was. Also, I love illustrations, even quirky and weird ones like the those that grace this cover. If I had to pick a focal point that really stands out on this cover for me, it’s that cloud and the color palette. How does this cover relate to the story? What’s your favorite part about the cover? 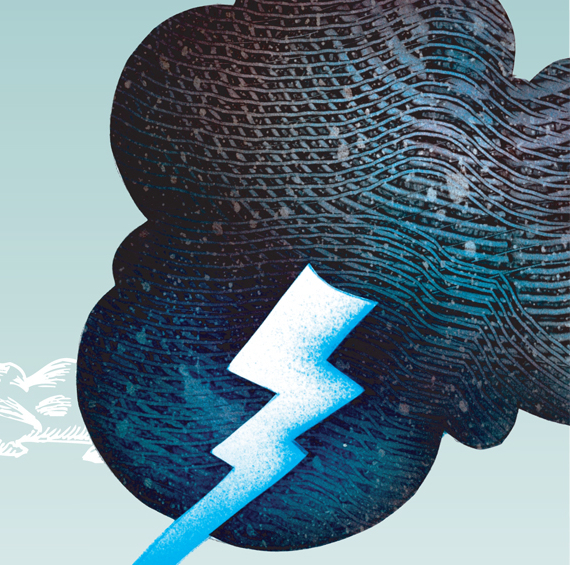 JJ: The lightning is integral to the story, and the cover offers it to the reader in both a literal and metaphoric way. There’s a dynamic tension there: is Evie (our heroine) creating the lightning? Or is she being struck by it? Or simply reaching out to it? As you read the novel, you’ll flip to the cover again and again … and your interpretation of the cover will change. I love that it’s an artful cover; I appreciate how the cloud looks etched, almost like a woodblock print. And my graphic artist friends love the font! TCG: As an author, what do you think is the most important message that a cover should relay? Should a cover be succinct to the novel’s message? Allude to something? Or should it just catch someone’s attention, no matter what it looks like? JJ: It’s important that the cover catch your attention, engage your eye and your mind. You shouldn’t judge a book by its cover—but of course we all do! I love a cover that relates to the story, and I can’t stand it when the cover makes no sense or has no relation to the story. When you’re reading, it’s not like there’s a movie reel showing on the back of your eyeballs; reading generates a visual shorthand, rough sketches in your mind. Covers can add to that, open a door, invite you in. It’s an invitation to engaging the visual mind of the reader. TCG: Are there any trends in YA cover art that you’ve seen lately that you’ve noticed and loved? 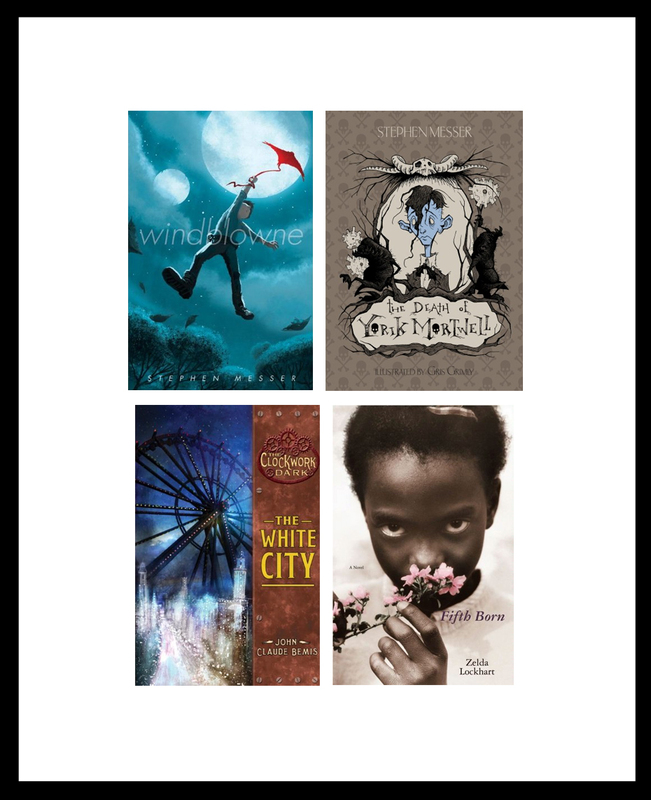 Or, have you noticed an evolution in YA cover design in the past few years? JJ: You know, at the risk of sounding ancient (which I’m not, I swear! ), when I was growing up and reading YA, the covers were generally illustrations—not photos—of the main character of the novel: her/his face, usually head-on, as though the character was looking right at you. Hair color and length, skin color, eyes—it all jibed with the author’s description, and added a bit more. I loved those covers. The clothes and body shape/size weren’t important, except when they illustrated a time or place (like historical prairie dresses). I liked knowing what the main character looked like, and I liked that s/he was looking at me, engaging me in her/his world. I miss that trend in cover design. And as I said before, I worry about all these “headless girl body” covers that are all about the clothes and size of the heroine. It doesn’t send a healthy message. As for recent covers I like? These examples aren’t YA, but I love the cover of WINDBLOWNE, a fantasy novel by my friend Stephen Messer, and his upcoming novel THE DEATH OF YORIK MORTWELL has an amazing cover. John Bemis’ CLOCKWORK DARK series has lushly illustrated covers. As for a photographic cover that really stands out: FIFTH BORN, by Zelda Lockhart has an unforgettable image of a young girl. TCG: Anything else you’d like to add regarding TGID’s cover art? JJ: Just that working with Peachtree’s team has been a great experience. 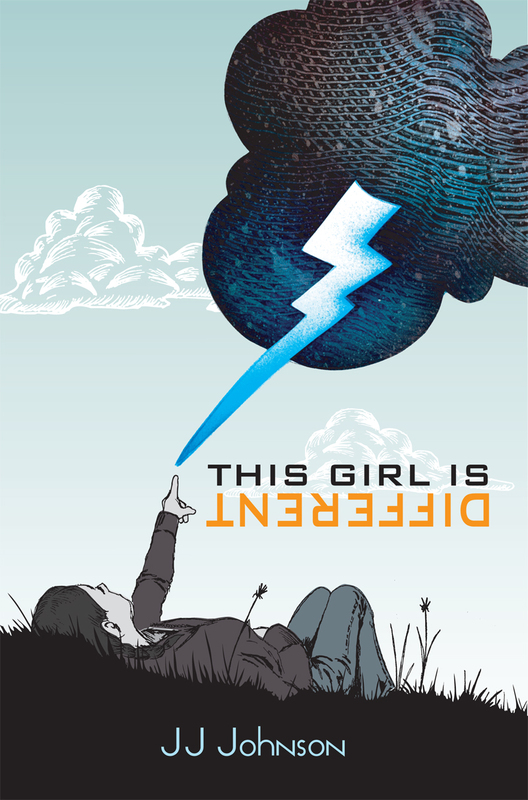 I hope readers of THIS GIRL IS DIFFERENT like the cover—and the story! Thank you so much for the interview, J.J.! Peachtree, high five to you for collaborating with J.J. to create such a uniquely attention-grabbing cover. Or I should say that congrats are in order to Mo Withee, the designer, who’ll be stopping by the blog tomorrow!